If you are in Manufacturing using Salesforce, one of the common questions or complaints you hear from your sales teams would be as follows. This post would provide you pointers and solutions which would help you to solve this problem effectively. We all know that if Salesforce role hierarchy is done right, most of this problem would have been solved. But if you have SAP as your ERP system, you end up with accounts with account owner as integration user. This is because of bad data or there was not account owners defined in your source system SAP or ERP systems. The other challenge is folks confuse the role with titles of their company. This results in creating too may roles with too many hierarchies causing complexities. The third cause of the problem is having multiple team members like product or application managers, support and other folks to work on the accounts. Account teams are an ideal solution but most of the teams seldom use it. To summarize the most probable causes of the problem are as follows. Having bad account owners on an account like integration users. Too many roles mimicking your company titles. Not leveraging account teams for team members who need access. External integration jobs populating account owners and team members creating data quality issues. So what are things you can do to solve this problem? To fix the problem for sales managers to view their sales reps accounts, you need to redo your role hierarchy. This would mean talking to the sales team, identify the real account owners and identify regional and divisional global sales managers under them. To make this easy, you will need to do a mapping of your current role hierarchy to the new role hierarchy and remove the unwanted ones. If you have roles which were just created to copy your organization titles, consider merging them to a new role. Things to watch out for. Never do this in production right away as this would mess up the visibility of data to your sales team causing great problems. Do this in production with a test plan. Get a count of records which current sales teams can see with current role hierarchy compared to the new one and fix it accordingly. Remove account owner records which have integration user on it or use it for unwanted old accounts. The below screenshot shows an example of a redesigned account hierarchy. 2. Fix Parent Accounts for Global managers. If you are using parent accounts and have global accounts which have child accounts under them, you need to update the global account owner as the owner to the parent account. In scenarios, where this could not happen, you need to leverage account teams and add the global account owner as the member of the child accounts. This would help the global account owner to view all accounts and activities. Things to consider. Consider creating lightning components on parent accounts to help global account owner to view all related tasks and activities under the parent. Leverage DLRS( Declarative lookup rollup summary to roll up key sales, marketing, and service metrics on the parent account for the global account manager to act on them. The below screen shows how global managers can be assigned a new role based on the modified role hierarchy. On scenarios where you have multiple team members working on accounts and opportunities like product or application managers, technicians and other folks, account teams and opportunity teams should be leveraged on accounts. This would help in providing account based support and help the support teams to move the pipeline forward. Things to consider. 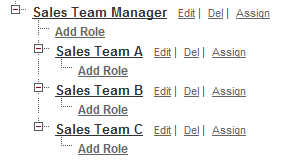 If you have batch jobs from SAP populating accounts, change the jobs to create account team members based on rules. Leverage opportunity teams for unique sharing needs and empower the account owner to manually add opportunity and account team members on an on-demand basis. For sensitive accounts and opportunities, leverage sharing rules to provide visibility to only predefined account members. 4. Fix your profiles and permissions to validate new account sharing. As you plan to recreate role hierarchies with a current and new state, permissions have to revisited to ensure data access does not change with the new design. Here are things you can do to make this happen. Create a new Crud matrix for each role and objects and define which objects need to create, edit, delete and update access. Identify sharing rules which would create hide data from the changes in the role hierarchy and plan to modify them. Create security requirements on which objects will have global access vs restricted access and document them. I hope this post provides you the guidelines to start on this journey to fix your org and empower your users to view the right data at the right time. So as key takeaway, here are 3 things you need to do. Work with the business to identify a current and future state role hierarchy and permission before you start the project. Identify security requirements which are global and unique for data. If you use SAP and use sales orgs as accounts, consider changing the batch process to update right accounts with account owners. If you are in this journey, I have a tool kit with templates to do role hierarchies, permissions and security requirements which would help you to get started quickly. Please feel free to email me at buyan@eigenx.com to discuss further or feel free to comment below on your questions.